Posted on March 10, 2016 by academicbookfuture	in academia, academic books, Community Coalition and tagged medievalists, Quadrivium. Continuing the Project’s emphasis on working with specialist academic disciplines, on 25-26 February 2016 the Project consulted with medievalist Early Career Researchers, sponsoring this year’s Quadrivium, with the theme: ‘The Academic Book of the Future: Identity, Use, and Creation of Academic “Books” for Medievalists.’ This scholarly group has a very specialist set of research requirements – often studying content that can only be found in ancient manuscripts, or in archaic languages such as Latin or Old English. This specialism raises specific issues around the academic book, which the Project is keen to investigate. 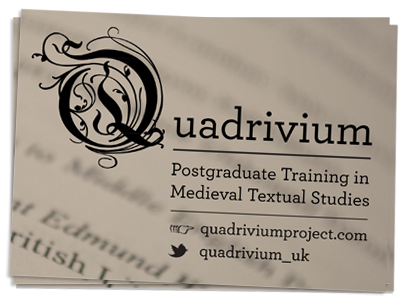 Quadrivium is an annual research, careers, and skills training event for postgraduates and ECRs of medieval and early modern textual studies. 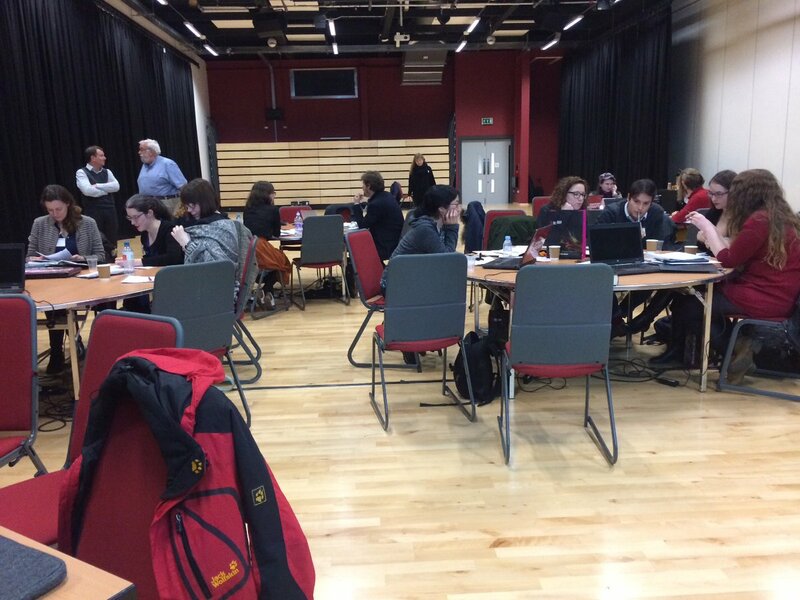 The two-day event took place at De Montfort University, Leicester. When you finish your PhD, will you want to write an academic book? If so, what sort of academic book would you want to create? The resulting discussion revealed the complexity inherent in these seemingly simple questions. Audience and authors – who reads academic books, and who writes them? The important question was also raised: What IS an academic? This was highlighted as requiring definition too, but was outside of the scope of this conversation. How do you feel about making an academic book? The ECRs stated their awareness that the monograph still commands huge respect, and is also expected in terms of research output and evaluation purposes, such as the REF. However, it was suggested by some that in the future it would be good to have the option of the academic book in other forms, such as a portfolio of work. Dr Ryan Perry (Uni. of Kent) suggested that research output could take the form of a collection of case studies, without the enforced requirement to be synthesised into a central thesis. How do medieval scholars use academic books? This suggestion connected to notions of reading methods. Prof. Andrew Prescott (Uni. of Glasgow) for instance, stated that he usually reads monographs from cover to cover, whereas Dr Perry tends to dip in and out of them, using the index to navigate to required material: ‘There’s something beautiful about a well-constructed monograph, but I most often enter them from the index, rather than reading them from cover to cover. This, the group concluded, is why readable/searchable digital academic books are so important – offering the choice of deep reading from start to finish, as well as meaningful possibilities to search effectively; to dip in and out as required, depending on the scholar’s requirements and preferred reading style. What do (medieval) scholars want from academic books? Videos and enriched content – such an animated marginalia! What can technology do to help make academic books more accessible for medievalists? The medievalist ECRs were asked to consider ways in which technology does, or should, make their research life easier. Having an electronic copy of an academic book or a digitised manuscript allows for a more global scholarship on that material, eliminating the requirement of being in the physical vicinity of that book. However, the pitfalls of digital versions include the possibility of being locked behind a paywall if your institution does not subscribe or if you are an independent scholar. It also excludes scholars with technological impairments – such as those living in areas without consistent Internet connections. It also means that undigitised books or manuscripts may be neglected, with a glut of scholarship being written on manuscripts that are available online. After this group discussion, Michael Pidd (Sheffield), Dr Ryan Perry (Kent), and Dr Hollie Morgan (Lincoln) presented their own experiences and thoughts around the academic book using case studies of innovative research and outputs that they have produced, as well as other ongoing work – followed by a fantastic plenary talk by Professor Andrew Prescott, and a second day of workshops and discussions. This part of Quadrivium will be discussed in a separate blog post. Huge thanks to Dr Takako Kato for organising this fantastic event, and to all of the speakers and participants for attending and contributing.